When we moved into our house, I really liked the floor in our main bathroom. It had small blue tiles and white grout, and it’s in an interesting geometric pattern. It’s not exactly contemporary, but I decided that it was just dated enough that I could call it vintage. Sure, the grout was dingy and kind of stained, but that didn’t seem like a big deal. If you have a room with a lot of light-colored grout on the floor, don’t despair. You can clean it with some hard work and all the right tools, and then you’ll feel all happy and accomplished for having done so. Mop your floor. I use a solution of 1 part vinegar to three parts water. 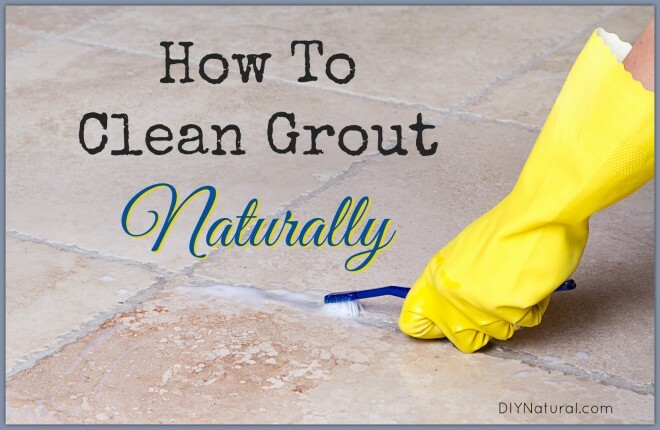 You might not get the grout totally clean, but you need to start with a clean floor. Get the surface grime off so that you’ll be able get the deeper stains off when you’re really ready to scrub. Make a paste with the lemon juice and baking soda. I’m not giving exact measurements because this depends greatly on the size of your tile floor, but you want your mixture to be thick and paste-like. Start out with a certain amount of baking soda (maybe a quarter cup) and add tablespoonfuls of lemon juice until you have reached the desired consistency. Spread the solution out on the grout lines. Let it sit for a few minutes, and then scrub it with the tile brush. A grout brush is a great tool for this because they have extra stiff bristles, but if you don’t have a grout brush, an old toothbrush is a great substitute. It’s kind of funny that this is only one step, because it’s going to take you way longer than the rest of the process. You’re going to have to really, truly scrub. If you’re working on a whole kitchen, expect your arms to be sore. Also, be sure to start at the back of the room and work your way to an exit – no scrubbing yourself into a corner, okay? You’re going to have to mop again. Sorry. But you just scrubbed sticky lemon juice all over the floor, and it’s not like you can just leave it there. I use the vinegar/water solution as in Step 1, and make sure you get all of the residue up. By the time you’re finished, you should have a super clean floor and grout that is much lighter. If you have any stubborn stains that didn’t come off, try soaking and scrubbing them with peroxide. Do you have any other tricks for cleaning your grout? Let us know in the comments! I have read that the citric acid in vinegar and lemon juice breaks down grout and should never be used on grout. This is why McD’s floors are always in bad shape, because they purposely use citric acid cleaners thinking that they are doing a better job of cleaning their floors. I too clean houses for a living,I have a house that is all marble tiles and acres of grout!!!! I use peroxide. Spray it out of a bottle and let it sit, then I use my steam mop,works very well, and it’s not too harsh,and I’m not on my hands and knees!!! I found that mixing a little dishwashing liquid with hydrogen peroxide works wonders. Put it in a spray bottle and spray it on the grout. Let sit about 10 minutes then scrub. If it dries just get your toothbrush wet – if it isn’t already. I am a professional cleaner with 16 years of experience. Your advice is ok for people who have ceramic tile but if they have natural stone like marble your advice will ruin their floors. You can not use any acidic products on most natural stones without it etching the floor. The best way to solve the grout problem is to colorseal your grout. Any hints for cleaning wall tile grout? It is difficult to keep the mixture on the grout for any length of time. Thanks! !